There is not even a single soul on this planet Earth who doesn't love receiving gifts. I love giving and receiving gifts and people who know me make it a point to gift what I love the most :EARRINGS:) not that I am complaining. Again most of my friends know my choice of earrings, and it makes it easier for me to receive the gifts with a beaming face. Being my balcony mate at Amrita, Anu used to make occasional visits to my room to scavenge through my earring box. When we met last day after a year's gap, we acted like two 16 year old, sharing secrets ear to ear, giggling uncontrollably, commenting on good looking guys......She trusted a small pack into my hands and told me that it's a small gift from her. I tucked in the packet into the deepest pockets of my bag .Should have sensed it then and there what the gift was but, the excitement of meeting her after loong time occupied 3/4th of my brain. 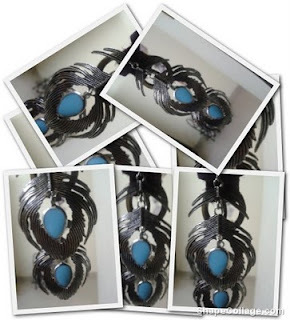 Back home as I opened my gift my jaws dropped "FEATHER EARRINGS and that too with TURQUOISE"...I wanted to own one for quite some time,and was planning to even buy one online from ASOS (All thanks to my Mastreo card I couldn't). How could she read my mind? .Well, it's one gift you guys are going to see quite a lot off. What makes my gift special is the fact that the earrings are from FINLAND. Anu was on a scholarship to Aalto university for a year. 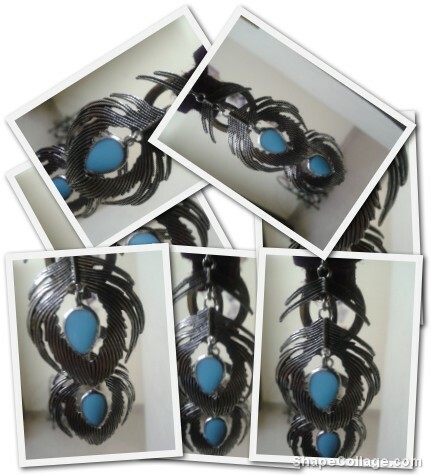 So, presenting before you my first piece of FOREIGN jewelery :).My own pair of turquoise+ silver feather earrings. PS: The picture is misleading, the earring is just a simple feather,no layered jewelery. The pic infact shows the pair.